The Harvest Caye Project is at a standstill after the Supreme Court ruled against the Department of the Environment (DOE) and the National Environmental Appraisal Committee (NEAC), following the DOE's decision to approve the construction by Belize Island Holdings (BIHL) of a cruise port at Harvest Caye in the Stann Creek District, due to a breach in EIA regulations. The decision was made on Wednesday, January 13th following a lawsuit filed by the Belize Tourism Industry Association (BTIA) asking for revision of the development’s EIA. 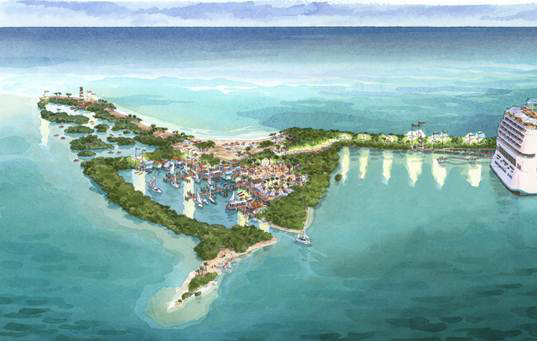 According to BTIA, the Government of Belize (GOB) approved the Norwegian Cruise Line (NCL) development without taking the proper steps required when considering a project of such magnitude. During the ruling, Supreme Court Justice Courtnenay Abel stated that DOE did not follow the laws when it approved the EIA for Harvest Caye. The main concern was that the EIA consultation notices were never made public as required by the Laws of Belize. The court also ruled that the content of the published notice in the Amandala and The Reporter were deficient in various areas, and that the decision of the NEAC to recommend the approval of the EIA was in breach of EIA Regulations, prior to considering the EIA for approval. In his remarks, Justice Abel expressed concern over the way EIAs are approved, and hopes that with this ruling, such incidents are deterred. “This ought not to have happened, and one hopes this will not happen in a similar situation in the future,” said Justice Abel on the EIA’s approval. For losing the lawsuit, the defendants have to pay all costs of the BTIA’s court proceedings at a total of $50,000BZ. “This case was about the future. As the Chief Environmental officer pointed out, the Harvest Caye project was among the top three dredging projects in the country, in terms of scale and magnitude. We are also pleased that the judge pointed out that this was not to be seen as merely an academic exercise: there were major matters of principles that needed to be considered. The message to GOB and to the DOE is that you need to fully perform your legal obligations in relation to projects,” said President of BTIA, Osmany Salas following their victory at court. But while the Supreme Court’s decision has delayed the project, it has not fully stopped it, and NCL still intends to open the port by the end of 2016. "BTIA is not against large tourism development projects. It has always advocated that the Government of Belize must ensure that the EIA process is fully complied with, no matter who the developer is, and that meaningful public consultation is had in the interest of safeguarding Belize's natural and cultural resources. It is the integrity of these resources that makes us a premier tourism destination,” said Salas. Developers will now have to resubmit the EIA including the public consultation for re-approval before construction can continue.